A piezoelectric element is a very simple, yet remarkable device. In its most simple form, it consists of a disk of brass or other conductive metal, on which a very thin disk of ceramic is adhered. 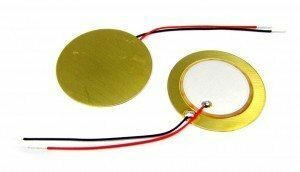 Leads are soldered to the ceramic and brass, and when the piezo is excited by changes in pressure (such as string vibrations), very small amounts of electric current are produced by the interaction of the ceramic and brass. This current can be picked up by a guitar amplifier, and is recognized by the human ear as a reproduction of the instrument’s sound. Because it is responding to vibrations, the piezo is inherently an acoustic pickup, and can produce very different sounds depending on where and how it is mounted, and also depending on the nature of the instrument in which it is mounted. A rod-style piezo is just a slender rod on which a number of small ceramic rectangles are glued, over which runs a thin copper strip. A magnetic pickup, on the other hand, is composed of copper wires carefully wound around a number of magnetic poles, usually one pole per string on the instrument it’s to be used on. The way the pickup works is that when the magnetic poles are mounted close to steel guitar strings, and a string is plucked, the vibrating string interacts with the pickup’s magnetic field. This interaction causes a small amount of electric current to be produced in the pickup’s wiring, which is then picked up and amplified by a guitar amp. The magnetic pickup does not react in any way to the acoustic vibrations of the instrument it is in, only the vibration of the strings. Because of this, the same magnetic pickup will produce much the same sounds whether it is mounted in a standard electric guitar, a cigar box guitar, or a guitar made out of a cinder block. The only real requirement is that the pickup be close enough to the strings so that they excite the magnets sufficiently. There are of course many variations in both piezo pickups and magnetic pickups. Piezos can be made as disks, rods, cables and thin, bendable strips; magnetic pickups can have varying numbers of poles, can be single or double-coiled, and can be over or under-wound to create specific qualities of tone. We hope that this basic overview of the differences between piezos and magnetic pickups has been useful and informative for you. There is of course much more that could be said – entire books have been written on the subject, and master craftsmen have spent many years perfecting their special pickup winds. But the best place to start is with the basics! I have ordered a piezo to make a cigar stomp box and I would like to include a volume control on the box. There are are a couple of options on your site regarding the ohms etc. can you advise what the difference is? and which one I should get..
clearly I am an electronic newbe!